Posted on Thu, Sep 27, 2012 : 5:58 a.m. Imagine a scenario where the red-inked margins of college essays are replaced by a succinct video analysis, a cosmos where the grade isn't circled on the final page of the paper, but is slyly tucked into the audible comments of your professor. 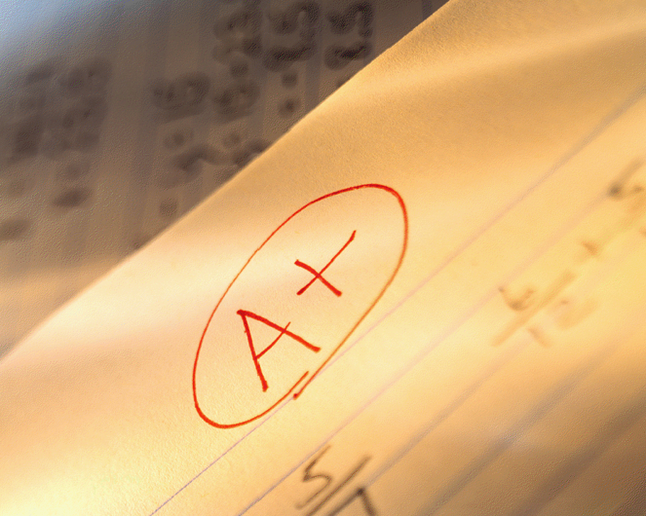 Receiving back a graded paper is a near-universal experience among the college savvy. Students usually grab their returned essay at the end of class, tear through the pages in search of the final grade and are either instantly inflated or deflated by the result, often ignoring comments penned in the margins. Yet a new modern twist to grading repackages the feedback, and the grade, willing students to internalize suggests and corrections made by professors. Using a method called screencasting, a small but growing number of college instructors record video critiques of student essays on the computer and upload them into online student accounts. The video captures the contents of an instructor's computer screen —usually a student's paper— as the teacher narrates the good, bad and ugly resulting from the student's effort. "Screencasting was pretty remarkable. It was the best feedback I've ever gotten on a paper," said University of Michigan senior Aaron Metviner, a history major. "It feels not unlike actually being in the instructor's office and having a quasi-conversation with the instructor, because the instructor is actually walking through the whole paper and giving you really rich and extensive feedback." Screencasting is more commonly used to capture lectures so students can refer back to them later. "Over the course of a couple of years you build up a library," said Phil Deloria, U-M College of Literature, Science and Arts associate dean for undergraduate education. A growing number of instructors are screencasting lectures before class, assigning them as homework and using classtime for discussion. Metviner was graded by screencast in a crime writing class he took his sophomore year. He's one of many students that don't always take red-inked margins seriously, often times skipping them over in a rush to see what grade the paper received. "Most students ... don't even read the feedback and internalize the feedback," he said. "This is infinitely more interactive and forces the students to really have almost an office session with the instructor." U-M political science professor Mika LaVaque-Manty uses screencasting to grade short papers (five pages or less) and blog posts. Overwhelmingly, most students prefer the method to traditional grading, he says. "Students react to our comments differently," he said. LaVaque-Manty's wife, English instructor Danielle LaVaque-Manty, uses the method for most of her courses. During a 100-level writing course she surveyed her students on whether they preferred traditional grading methods or screencasting better. Eleven out of 16 students surveyed preferred screencasting. Those who did said the feedback was more extensive, more personal than with traditional grading. "They're really getting more words, I can say more," she explained. Watch a screencast of her survey. The method also is flexible. A screencast captures images of whatever is on the author's screen; if a professor wants to leave the view of a student's paper, he or she can pull up a website or resource to illustrate feedback. For example, the instructor might refer back to a power point presentation used in class to remind the student of an earlier lesson. Web-based screencasting systems are offered free-of-charge online. A commonly used provider is Jing. More than a decade ago, U-M French professor George Hoffmann began audio recording his feedback on student papers using cassettes. As technology advanced, so did Hoffmann's technique and the professor now regularly uses screencasting to grade his pupils. "I felt like the students were not really taking in all the correcting and the feedback in the margins. They were really just kind of checking the grade and chucking the paper," he said. Screencasting, he added, was a way to make the grading process more "congenial." "Students said they could actually believe what I was saying in the comments. My tone of voice made a difference to their understanding. They could tell I wasn't mad at them if I said something bad." For some professors, screencasting can save time. LaVaque-Manty estimates she saves roughly five minutes in grading time per paper. Her husband says the time-cost is roughly the same as traditional grading. Both keep their video feedback limited to roughly five or six minutes. Hoffmann, on the other hand, records longer videos, sometimes 30 minutes long, and thus the method can be time consuming. All three say the end result is usually richer than traditional grading. "If you want to provide students with concrete examples of how to improve their writing, you can do that verbally easily, whereas hand writing them is time consuming," said Chad Hershock, assistant director of U-M's Center for Research on Learning and Teaching. "The depth of the feedback can be much greater to the student without adding to the instructor's time spent grading." Educators interviewed for this story said students appreciate the ability to pause, rewind and revisit the feedback in the video. After receiving feedback via screencast on the first draft of a paper, Metviner used the advice to guide his second draft. "It was much easier to refer to that rather than just some red pen markups on the page." Metviner said he saw no negatives with the grading method. Mika LaVaque-Manty, however, said that a small number of students complain that the method buries the grade and that video feedback is too difficult to internalize. Some professors who have tried the method say creating the videos is too time consuming because they have to worry about grammar and using efficient verbal feedback. "Some people try it and like it or some people say it's not for them," he said. Although screencasting is slowly catching on, but educators still say it's a long way from becoming a mainstream method of grading. Those interviewed for this article only knew a handful of other instructors who have used the method. From his perspective as a student, Metviner is perplexed why more professors don't use the method. During his 3 1/2 years of college, he has received his grades back via video in just one course. "Still in 2012 the standard feedback on papers at the University of Michigan is a red pen and maybe some notes in the margin, but usually just a paragraph or two at the end of the paper," he said. "I just think feedback which is not only vocalized by the instructor, but which goes along with the paper on the screen is much more powerful than red pen feedback." Fri, Sep 28, 2012 : 4:54 p.m. If video comments are so much better, so much more engaging, and so much more useful than written comments, one can only wonder when the U will begin to allow students to Skype their papers rather than write them. Thu, Sep 27, 2012 : 2:05 p.m. This is excellent. Much better than a couple of words scribbled in the margins of a paper. Thu, Sep 27, 2012 : 11:33 a.m. Yes! Personal contact and building social skills are not needed as our children grow to become productive members of society. Thu, Sep 27, 2012 : 2:01 p.m.
Did you read the article? Would you care to explain how these screencasts somehow remove or replace personal contact? Thu, Sep 27, 2012 : 1:47 p.m.
What kind of personal contact and social skills are being missed by not marking a paper up with red pen? Did you read the article?